Manly Takeaways is our local fish n' chip shop whenever we are up at the family beach house on the Whangaparaoa Peninsula, just north of Auckland. The beach house was built in 1959 I believe, and almost all flat surfaces are covered in Formica, my grandfather was a Formica salesman. (I am not entirely sure about these facts, family members may correct me). I have been going to the beach house ever since I was a baby, and I therefore assume eating fish n' chips from Manly Takeaways since then too. At the beach house I do the same things I have always done - swim for hours, go boating, eat large amounts of plums from the trees in the garden, do puzzles, read low-brow detective stories and do numerous sketches of Kotanui, the island that lies in the centre of Matakatia Bay, where our house is, always from the same angle. It has a misleading appearance: from the front, it is like a witch's hat settled on the water, but from the side is more like a rather prominent nose protruding from the sea. Beach house holidays are a time for doing the same things I have always done. 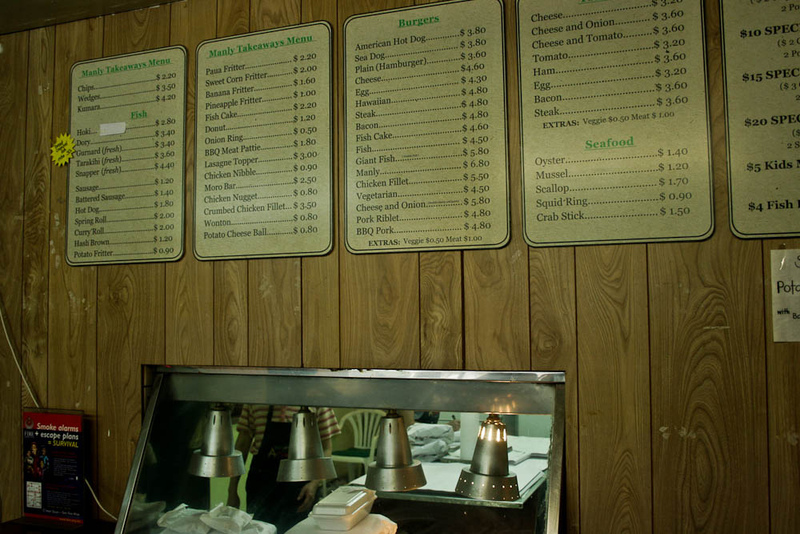 The menu boards at Manly Takeaways do nothing but add to the dingy 70's charm of the place, as I always always order the same thing - a fish, a hot dog (in the NZ fashion - a battered sausage on a stick doused in sauce) and a helping of chips. Actually, I think my entire family still all order the same things they did ten, fifteen years ago. The map is one of two aerial photos which hang in the fish n' chip shop. 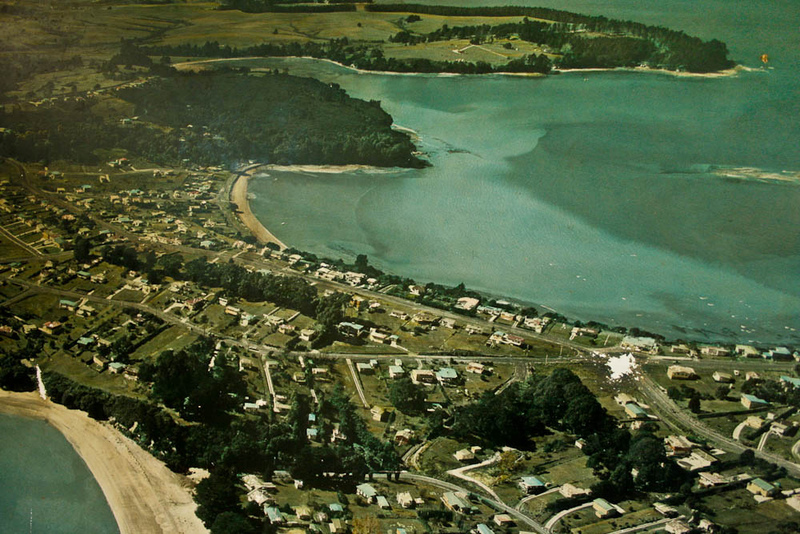 Here it shows Matakatia Bay around the early 1960's, with the beginnings of the reef which stretches out to the island. Every time we get fisn n' chips, I make a point of spotting the beach house in the photo. Ritualistic, almost, just like everything else about my weeks spent up there.